Located in the midst of nature surrounded by endless forest, Nectar, in collaboration with CARLES TACHÉ GALLERY & ON MEDIATION_Platform on Curatorship and Research, presents its first multidisciplinary art residency program offering a community-based living and working experience for worldwide artists in all career stages. The residency is a unique opportunity to delve into the artistic and creative process enjoying rural environment and a great opportunity to connect with Barcelona Art scene. In its first artist residency program, Nectar will work in collaboration with ON MEDIATION_Platform on Curatorship and Research, an initiative of the Research Group Art Globalization Interculturality (AGI) from the University of Barcelona. The artists will have the chance to present their work in an Open Studio event and gather along with On Mediation team and guests from the local art scene, enabling a space of conversation and feed-back. On Mediation team will write a short text about each artist’s work that will be published at OMMagazine. The culmination of the residency will be a one month exhibition in CARLES TACHÉ GALLERY, one of the most well-known Contemporary Art Galleries in Barcelona, where the artists will present their works within the artistic Barcelona scene. The opening will be on June 9th 2018.​A one-day visit to exhibitions, art spaces, artist’s studios or other events in Barcelona will be organized by Nectar’s team. During their residency, the artists will have access to Nectar’s administrative and human support and to its network with local artistic and cultural community. Documents can be written either in English or Spanish. Results will be announced on April 12th 2018. 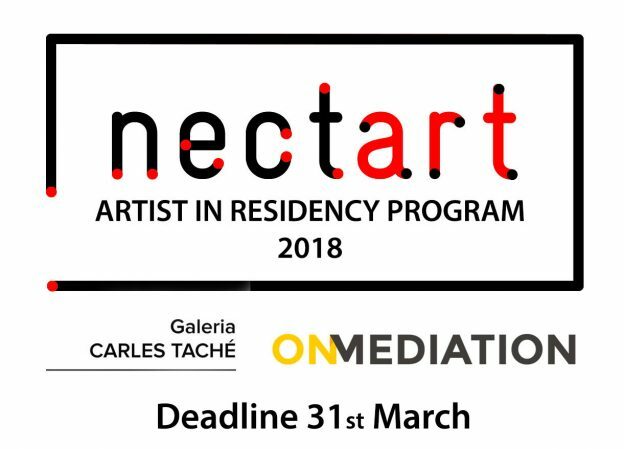 Don’t miss the chance to win one fully funded and three 50% funded 3-week residency in Nectar + one month exhibition at Carles Taché Gallery (Barcelona). 1 Full grant (100% funded): No costs / 3 weeks / Private room. Confirmation of the stay at the residency must be done within one week after the announcement. 3 Partial grants (50% funded): 600€ / 3 weeks / Private room. Confirmation & Payment must be done within one week after the announcement. Each artist will have to donate one work.